Sample Data :Western blot analysis of IRAK1 in THP-1 (THP) and HeLa (HL) whole cell lysates with IRAK antibody at 1:2000 dilution. 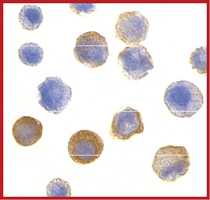 Sample Data :Immunocytochemistry of IRAK1 in HeLa cells with IRAK1 antibody at 10 ug/ml. Scientific Background :IRAK1 encodes the interleukin-1 receptor-associated kinase 1, one of two putative serine/threonine kinases that become associated with the interleukin-1 receptor (IL1R) upon stimulation. The exposure of HeLa cells or human embryonic kidney cells overexpressing IL1R to IL1 caused rapid association of IRAK with the IL1R complex and phosphorylation of IRAK (1).IRAK1is partially responsible for IL1-induced upregulation of the transcription factor NF-kappa B. IRAK1 as a risk gene with critical role in the pathogenesis of systemic lupus erythematosus (2). 1. 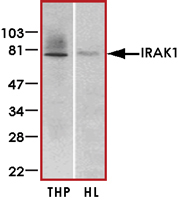 Cao, Z.et.al: IRAK: a kinase associated with the interleukin-1 receptor. Science 271: 1128-1131, 1996. 2. Jacob, C. O. et.al: Identification of IRAK1 as a risk gene with critical role in the pathogenesis of systemic lupus erythematosus. Proc. Nat. Acad. Sci. 106: 6256-6261, 2009.